Welcome to the City of Green River's Geographic Information Systems web page. Here you can view and download maps, and explore information using our interactive web mapping applications. The Geographic Information Systems (GIS) Division strives to efficiently and effectively coordinate and participate in the development, implementation, integration, maintenance, and distribution of geographic data. It is our goal to make geographic information readily accessible to city staff and the public. Standard maps of Green River are available in PDF format to view and download. You must have a recent version of Adobe Acrobat Reader installed on your computer to view these maps. The City of Green River GIS offers interactive maps that enable you to view information using a web browser. Visit the City of Green River Map and Application Gallery to access information specific to Green River. Search and view property information using Sweetwater County's MapServer application. 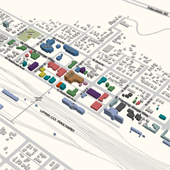 The City of Green River GIS offers hard copy maps and digital GIS data for minimal fees. Digital copies of GIS data files may be obtained for $25.00/CD. What does it cost to obtain a hard copy of a map?